“Faith is a gift of God which enables us to know and love Him. Faith is a way of knowing, just as reason is. But living in faith is not possible unless there is action on our part. Through the help of the Holy Spirit, we are able to make a decision to respond to divine Revelation, and to follow through in living out our response.” United States Catholic Catechism for Adults, 38. About Catholic Information Service Since its founding, the Knights of Columbus has been involved in evangelization. In 1948, the Knights started the Catholic Information Service (CIS) to provide low-cost Catholic publications for the general public as well as for parishes, schools, retreat houses, military installations, correctional facilities, legislatures, the medical community, and for individuals who request them. For over 60 years, CIS has printed and distributed millions of booklets, and thousands of people have enrolled in its catechetical courses. CIS offers the following services to help you come to know God better: Individual Booklets Contact CIS for a complete list of booklets and order the ones you want. Home Study Course CIS offers a free, graded home study course through the mail. In ten rigorous lessons, you will gain an overview of Catholic teaching. On-Line Courses CIS offers two free on-line courses. 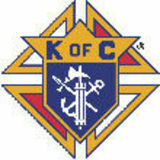 To enroll, visit www.kofc.org/ciscourses. “sovereignty” of the family is essential for the good of society. A truly sovereign and spiritually vigorous nation is always made up of strong families who are aware of their vocation and mission in history. The family is at the heart of all these problems and tasks. To relegate it to a subordinate or secondary role, excluding it from its rightful position in society, would be to inflict grave harm on the authentic growth of society as a whole. supreme values which lie at the foundation of the family and of human dignity are disregarded. May the Lord Jesus repeat these truths to us with the power and the wisdom of the Cross, so that humanity will not yield to the temptation of the “father of lies” (Jn 8:44), who constantly seeks to draw people to broad and easy ways, ways apparently smooth and pleasant, but in reality full of snares and dangers. May we always be enabled to follow the One who is “the way, and the truth, and the life” (Jn 14:6). Dear Brothers and Sisters: Let all of this be the task of Christian families and the object of the Church’s missionary concern throughout this Year, so rich in singular divine graces. 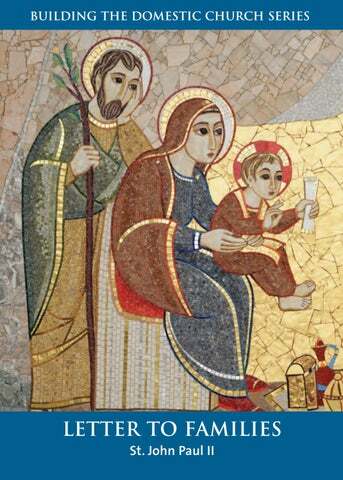 May the Holy Family, icon and model of every human family, help each individual to walk in the spirit of Nazareth. May it help each family unit to grow in understanding of its particular mission in society and the Church by hearing the Word of God, by prayer and by a fraternal sharing of life. May Mary, Mother of “Fairest Love,” and Joseph, Guardian of the Redeemer, accompany us all with their constant protection. With these sentiments I bless every family in the name of the Most Holy Trinity: Father, Son and Holy Spirit. Given in Rome, at Saint Peter’s, on 2 February, the Feast of the Presentation of the Lord, in the year 1994, the sixteenth of my Pontificate. 56. Of particular interest is the Address to those taking part in the Convention of the Italian Catholic Union of Midwives (29 October 1951), in Discorsi e Radiomessaggi, XIII, 333-353. 57. Cf. Address to the members of the â&#x20AC;&#x153;Consilium de Laicisâ&#x20AC;? (2 October 1974) in AAS 66 (1974), 568. 58. Cf. Dogmatic Constitution on the Church Lumen gentium, 40. 59. Cf. Cardinal Stefan Wyszynski, Rodzina Bogiem silna, Homily delivered at Jasna Gora (26 August 1961). 60. Cf. Second Vatican Council, Lumen gentium, 15. 61. Cf. Ibid., 16.